"Wonder," R.J. Palacio's debut novel, was written for children 8 to 12 years old, but its message defies genres. Published in 2012, its anti-bullying, pro-acceptance message will resonate with teenagers and even adults as well. Some books are action-packed, compelling the reader to turn the page to find out what happens next. Other books are compelling because they invite readers to engage with characters who are real, who come alive off the page, and who pull the reader into their story. "Wonder" is the latter kind of book. In fact, very little "action" happens within its pages, and yet readers will find themselves deeply affected by the story. August Pullman (Auggie to his friends) is not an ordinary 10-year-old boy. He feels like one and has the interests of one, but his face is not ordinary at all. In fact, it's the type of face that scares kids and makes people stare. Auggie is pretty good natured about it all. This is the way he is, after all, and while he doesn’t like that people stare, there’s not much he can do about it. Because his face has required many reconstructive surgeries, Auggie has been homeschooled. But there are no more surgeries to be done for a while, and now August’s parents think it’s time that he goes to mainstream school, beginning with fifth grade in the fall. The idea of this terrifies Auggie; he knows how people react to seeing him, and he wonders if he will be able to fit in at school at all. He bravely gives it a go, but finds that it’s much like he expected. Many of the children laugh at him behind his back, and someone has started a game called the Plague, in which people “catch” a “disease” if they touch Auggie. One boy, Julian, leads the bullying attacks. He’s the sort of kid whom adults find charming, but in reality, he is quite mean to anyone not in his circle of friends. Auggie does make two close friends: Summer, a girl who actually likes Auggie for who he is, and Jack. Jack started out as Auggie’s “assigned” friend, and when Auggie finds this out, he and Jack have a falling out. However, they patch things up at Christmas, after Jack gets suspended for hitting Julian for badmouthing Auggie. This leads to a “war," with the popular boys against Auggie and Jack. While nothing more than mean words, in the form of notes in the lockers, fly between the two camps, the tension between them lasts until the spring. Then there's a confrontation between a group of older boys from a different school and Auggie and Jack at a sleep-away camp. They are hopelessly outnumbered until a group of boys who were formerly against Auggie and Jack help defend them from the bullies. In the end, Auggie has a successful year at school, and even makes the Honor Roll. In addition, the school gives him an award for courage, which he doesn't understand, musing, “If they want to give me a medal for being me, I’ll take it.” (p. 306) He sees himself as ordinary, and in the face of everything else, he really is just that: an ordinary kid. It‘s the straightforward, non-sentimental manner in which Palacio approaches her topic that makes this such an excellent book. Auggie might have an extraordinary face, but he's a regular kid, and that makes him relatable, in spite of his challenges. Palacio also shifts her point of view, telling the story through the eyes of characters other than Auggie. This allows the reader to get to know characters like Auggie's sister, Via, who talks about the way her brother takes over the family’s life. However, some of the other viewpoints—especially of Via’s friends—feel somewhat unnecessary and bog down the middle of the book. The power of the book likes in how Palacio creates such a normal, relatable character from a boy living with such an extraordinary physical affliction. 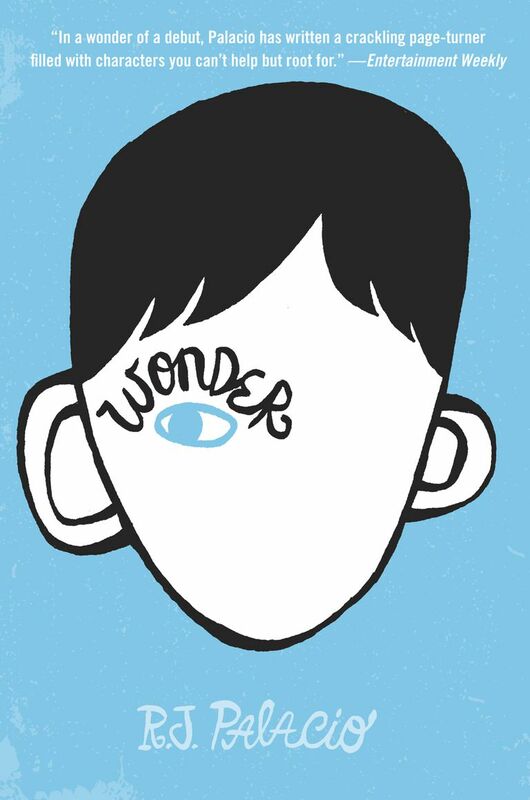 Even though "Wonder" is recommended for children ages 8 through 12, the book's themes of identity, bullying, and acceptance make it interesting reading for a wide audience as well. An art director by profession, R. J. Palacio first thought of the idea for "Wonder" when she and her children were on vacation. While there, they saw a young girl who had a condition similar to Auggie’s. Her children reacted badly, which got Palacio thinking about the girl and what she goes through on a daily basis. Palacio also thought about how she could have better taught her children to respond to situations like this. The book inspired Random House to start an anti-bullying campaign, called Choose Kind, with a site where people can share their experiences and sign a pledge to stamp out bullying. There you can also download an excellent Educator Guide for Wonder to use at home, or with a community grouop. "Auggie & Me: Three Wonder Stories," also by R. J. Palacio, is a 320-page collection of three stories, each told from the point of view of one of three characters from "Wonder": the bully Julian, Auggie’s oldest friend, Christopher, and his new friend, Charlotte. The stories take place prior to Auggie’s attending school and during his first year there. This book is neither a prequel nor a sequel to "Wonder"—in fact, Palacio has made it clear that she does not plan to ever write either. Instead, this book is meant as a companion for those who have already read "Wonder" and want to extend the experience by learning more about Auggie's impact on the people around him.